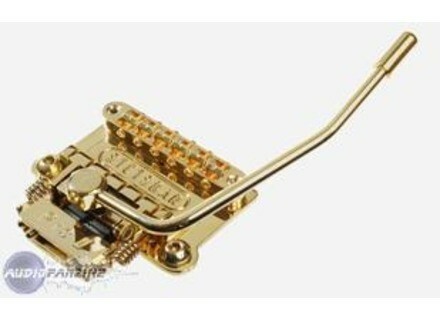 Pro II, Guitar Vibrato from Stetsbar. Stetsbar Introduces Pro II Vibrato System. 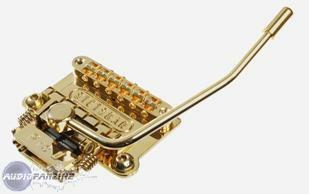 The new Stetsbar Pro II, is a vibrato with a new locking mechanism that is designed to maintain tuning if a string is broken, while still allowing normal up and down action within the vibrato. Unlike the Stetsbar Pro II, the biggest issue with other floating vibratos is that the whole set up is balanced at the zero point against the pull of the strings so that any change in string tension — breaking a string or dramatic string bends for example — will drastically put the system out-of-true. Another major advantage of the Stetsbar Pro II, is that the complete unit, including bridge, saddles and string anchors, effortlessly glides friction free, on highly engineered micro roller bearings. Not only does this totally eliminate string drag, but the travel path operates with precision accuracy and can be locked if a string breaks — maintaining stability, accurate tuning and still operating above and below the centre of pitch. The StetsBar Pro II is complete with full instructions as a straight forward surface mount installation on stop tail guitars, including Les Paul, SG and Flying V, a 'hard tail' mount for custom Telecasters, standard Tele mount and there's also an OEM version for custom builders. For guitars with stop-tail designs, Stetsbar simply drops onto the original bushings of the removed stop-tail — no extra holes to drill — and the guitar can be returned to stock if need be. For more information, visit their web site at stetsbar.com. Soloway Guitars - The Jazz Wing Soloway Guitars Introduces The Jazz Wing, Long Scale Guitar. Boss GT-10 Meet the new flagship of the BOSS multi-effects family. Carl Martin Classic Opto-Compressor Carl Martin presents the Classic Opto-Compressor, a new optical compressor pedal in the brand's Vintage Series.